I love pancakes and I love Shrove Tuesday. Pancakes are one of my fave things to have for breakfast or for a snack so having a day where I can eat them for any meal is a bonus! Yes I understand there is more of a background to Shrove Tuesday than just flipping pancakes. To be honest the day always reminds me of being at school cos I knew that the next day we would have to receive our ashes with it being Ash Wednesday. The nuns would be dotted all over school (I went to a convent school) on Ash Wednesday and there was no escape from getting that thumb printed black smudge on my forehead signalling the start of Lent. Anyway… I digress… this post is meant to be about pancakes, not ashes! Last week Sainsburys got in touch and asked me would I like to create a new pancake recipe which I readily agreed to. I’ve always preferred the American style/scotch pancakes cos that’s what we can buy at home. You can’t beat one toasted with grated cheese on top! I got thinking about toppings and flavours and I knew I wanted to create something different. 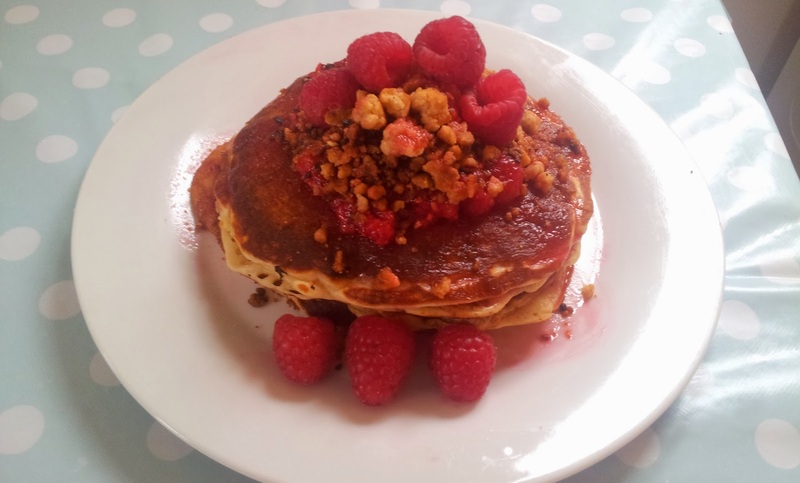 The rhubarb festival had been on in Wakefield weekend before last so that got me thinking and then it dawned on me – rhubarb crumble pancakes! I got so excited cos I love rhubarb crumble but for the life of me I could not find any rhubarb in the shops. I tried Sainsburys, Asda, Morrisons and Waitrose and they were either sold out or just weren’t selling it. 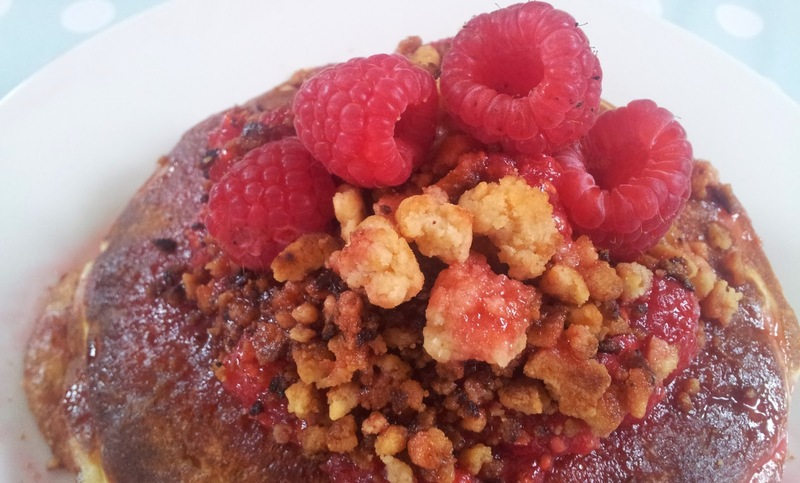 I was determined though that my pancakes would be crumble in some way and while I was stood in the fruit aisle I spotted some raspberries and decided raspberry crumble would work quite well too. I decided to use Nigella’s community recipe for the pancakes and adapted Delia’s recipe for the crumble and it worked really well. I’m still determined to try it with rhubarb though so I’ll be keeping an eye out for it next time I’m shopping. Put the wet and dry ingredients (from the pancake ingredients) into separate bowls and whisk. Slowly add the wet mix to the dry and lightly whisk until all of the flour is combined. Heat the frying pan on a low heat and using some kitchen paper rub some oil onto the pan. After a few minutes the top will start to bubble and once it looks firm around the edges you can flip it. Now while the pancakes are cooking you can get on with the crumble mixture. For speed I used my food processor but you can use your hands. Add the flour, butter and sugar to the food processor and blitz until it resembles breadcrumbs. Put the sugar and raspberries in a pan and cook on a low heat until the raspberries begin to soften and release some juice. Back to the pancakes! Once the last pancake has been cooked place them on a plate in the oven to keep warm. 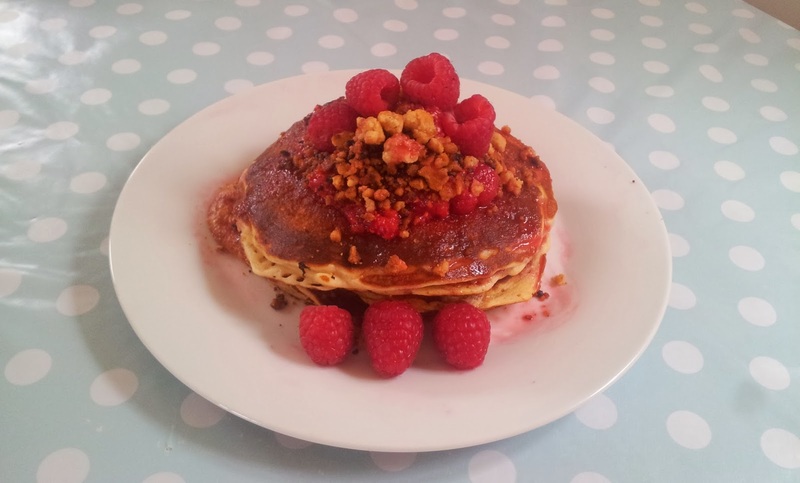 Once the crumble is cooked, remove the pancakes from the oven, stack on a plate, place the fruit on top, drizzle the pancakes with some of the juice from the fruit and sprinkle over the crumble topping. 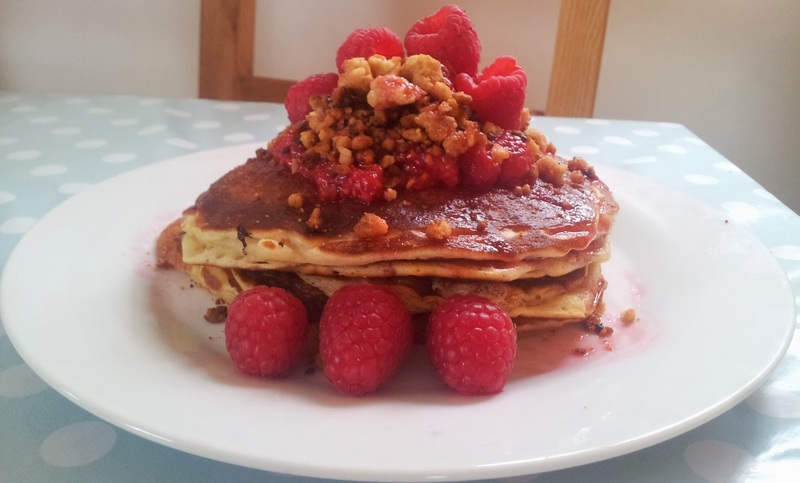 You can either go for one massive stack on lots of smaller ones.